Bromothymol blue (BMB) is a chemical indicator. During a neutral pH its colour is green, when it becomes for acid it turns yellow, and when it is more alkaline it become blue. Carbon dioxide (CO2) when combine with water (H2O) forms Carbonic acid (H2O3). This should cause a colour change in the BMB to yellow. In this practical you will be measuring the amount of Carbon Dioxide and Oxygen produced by plants through out the day. 2. 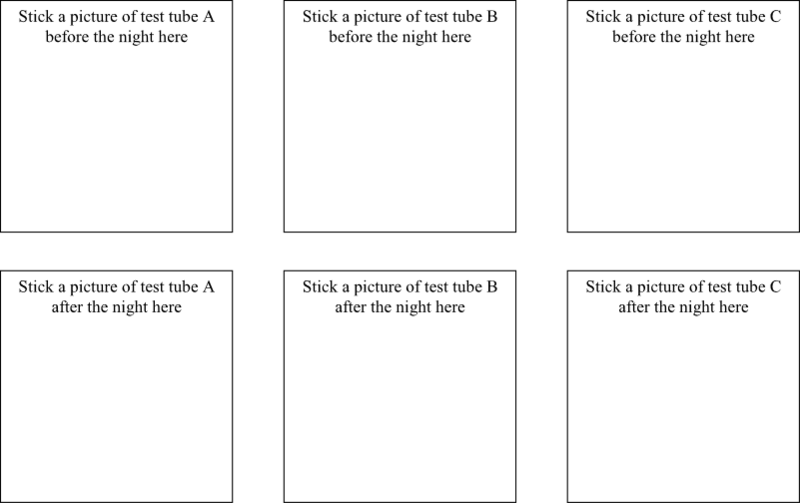 Label the test tube A, B and C and write your initials on them. 4. What is your hypothesis ? 9. If you could change this experiment to make the results more accurate, what would you change?